• This project involved the replacement of the existing structurally deficient bridge structure carrying Alford Road over Alford Brook in the Town of Alford. • Existing bridge was replaced with a 55-foot, single span superstructure using butted concrete deck beams with a 5" concrete deck and a 3 1/2" HMA wearing surface supported on integral abutments supported on steel. • Demolition and construction staging was planned to allow for a minimum of one traffic lane in each direction throughout construction. • This existing Bridge No. B-06-011 (2AW), Route 126 over CSX Railroad (Abandoned), was listed as structurally deficient and was demolished. • It was replaced with a culvert that provides passage for future rail trail use. - Roadway resurfacing, sidewalk reconstruction and stormwater improvements from Elm Road to Elm Street. • The new Bridge #E-10-013 is a three-span continuous with standard concrete frame piers and concrete stub abutments. • The continuity of the superstructure stringers allows for a shallower depth of structure, thereby increasing the vertical clearance without affecting either the Route 2 or track profiles. • The same type continuous structure was constructed for Bridge #E-10-016 to minimize impact to the roadway profiles. Due to current clearance requirements, however, Route 63 was lowered. 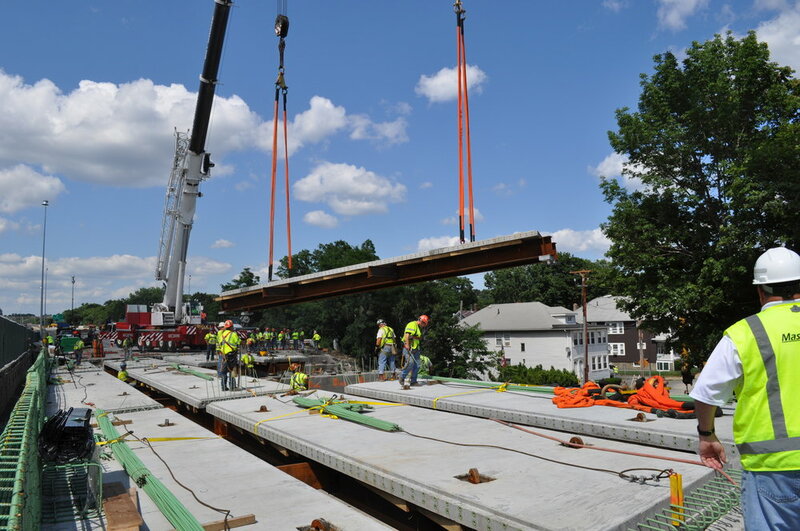 • The project involved the replacement of seven bridge superstructures (14 side-by-side bridges) on I-93 in Medford, MA. • Significant construction activities occurred only on the weekends using Accelerated Bridge Construction techniques. Thus, the seven bridges (14 side-by-side structures) were substantially reconstructed in twelve weekends, excluding the July 4th holiday weekend. • The accelerated schedule required that one bridge be demolished and reconstructed each weekend, except during two weekends where two bridges were completed. The contractor set up the work zone, traffic management devices and detours for traffic on Friday evening, worked through the weekend, and opened all travel lanes for the Monday morning commute. 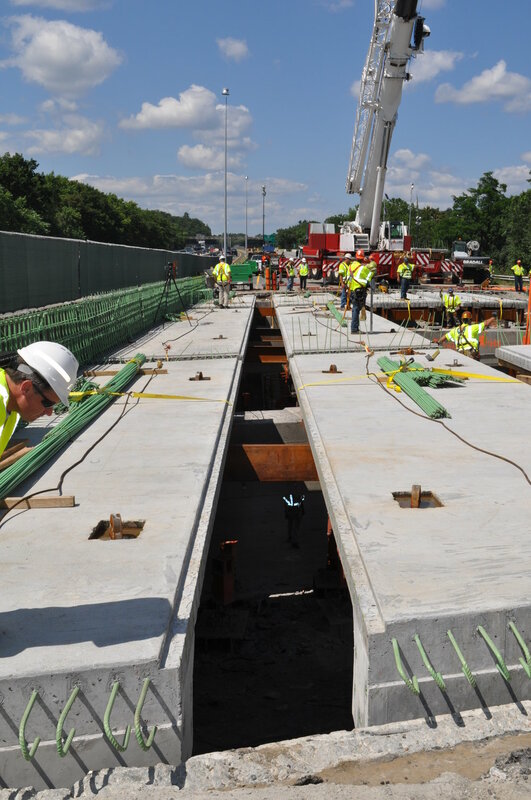 • Lin provided the superstructure design of the I-93 Bridge over Webster Street (M-12-028 & 029) and detailed modifications to the existing substructure including new concrete pedestals and transverse shear keys. (Pictured to the left). • Lin also performed the Quality Control Review of the design and details for the two bridges for I-93 over Salem Street. • The Longfellow Bridge is a major transportation connector between Boston and Cambridge carrying vehicular, pedestrian, cyclists & the MBTA Red Line over the Charles River. • Lin Associates is a subconsultant for the analysis, design, detail and plan preparation for all concrete substructure elements for the Boston and Cambridge Abutments, Piers 1 – 10 as well as roadway & MBTA reinforced decks within the limits of the aforementioned abutments and piers. • The original northbound and southbound structures were single span steel stringer bridges with a median opening between. The structures carry Route 1 over Lowell Street in the Town of Peabody. • With an average daily traffic (ADT) well over 20,000 in each direction over this bridge, construction staging and traffic management were significant concerns for this project. Two lanes of traffic in each direction of Route 1 were maintained at all times throughout construction, as well as one lane in each direction on Lowell Street. In order to accomplish this, the existing median opening was temporarily decked over and paved to allow traffic during respective stages of bridge construction. • Two 8”+ sewer lines, an 8” water line, and telephone lines were all temporarily relocated during construction and accommodated by the new bridge. • The new superstructure is single span bridge with separated prestressed concrete box beams, providing in each direction two 12.3-foot travel lanes, a 10-foot shoulder on the right side, and a 4-foot shoulder as well as a 6.5 foot sidewalk on the left side.